WordPress is a great content management system for restaurant websites because it’s free, easy to use, and it offers lots of great plugins you can use to enhance the appearance and functionality of your site. When creating websites for restaurants, your design needs to appeal to the five senses of customers. 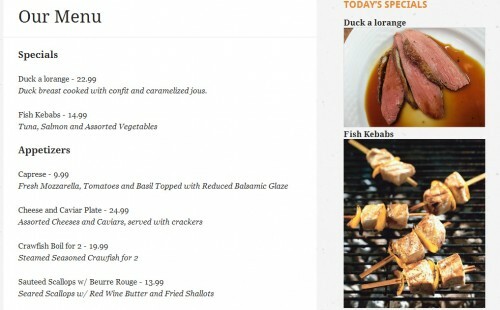 More and more restaurants are using WordPress to design their websites. I’ve chosen some of the best free WordPress plugins for restaurant websites which you can use to create and manage your online menu, add Yelp reviews to your site, enable people to place orders and make bookings through your website. If you want to display the list of offerings from your business, whether that is food, drinks, services or anything else, one of the plugins on this list should meet your needs. Be sure to check out the comparison chart and overall ratings at the end. If you liked the post, bookmark on Delicious, Digg, StumbleUpon etc to spread the word. We appreciate it! You may want to take a look at the following related articles: Free WordPress Full Width Themes, Free Menus Widgets for WordPress, Premium vCard WordPress Themes and Free WordPress Database Plugins. eCommerce Product Catalog plugin is powerful and basic at the same time. It is built by the experienced folk at impleCode who constantly develops the core and the extensions. Maintain your restaurant menu online and accept cash on delivery orders. Set categories, multiple prices per item and descriptions. Multilingual Frontend (just update labels in admin settings page and/or widget as required). WPML compatible. Get your data online easily and quickly with WebKite. Backed by the WebKite API, the WebKite for WordPress plugin delivers the filtering and sorting capabilities of sites like Kayak, Amazon, and Yelp. Foodlist is a plugin for restaurants, cafés, bars, etc. that want to display their menus online. With this plugin you can easily manage your menus (the same way as you do it with your widgets). Menus consist of sections and sections consist of items. You can reuse your items in multiple sections, as well as sections can be reused in multiple menus. Create a restaurant menu for cafes, bars and eateries, and display it in templates, posts, pages and widgets. 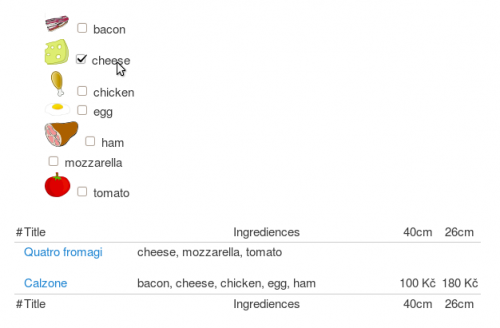 This plugin creates two new post types, Menu Items and Menus, which can be used to easily construct a menu. Create items on your menu, group them into sections and then build menus out of them. Restaurant Menu uses default WordPress functionality and makes use of custom post types, taxonomies, and custom meta fields to do the job. This allows you, to easily import and export your data using the built in WordPress tools. Turns WordPress instalation into powerful pizzeria site backend with ability to add pizzas, beverages and pasta. Plugin displays pizzas in clean menu table with all your customer needs to know – menu number, title, ingrediences, price for various sizes.